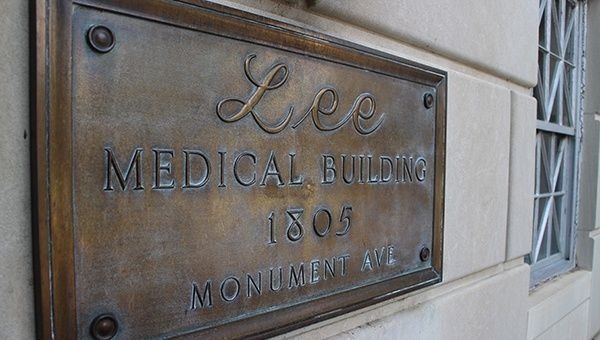 The city board of zoning appeals voted unanimously Wednesday to deny a special exception permit for the Lee Medical Building at 1805 Monument Ave., beside the Robert E. Lee Monument. The denial does not mean the plan to convert the property into 63 apartments is dead, as that number of units is already allowable according to a ruling by the city zoning administrator. 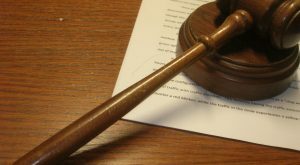 The decision does prevent the developer from being able to make structural alterations to parts of the building’s interior that Jennifer Mullen, the Roth Jackson attorney representing the group, said would have allowed more-efficient and spacious units. Mullen argued that the number of units was not at issue in terms of deciding the permit, as the ruling from the city zoning administrator found that existing property rights allow the conversion to the 63 units proposed. 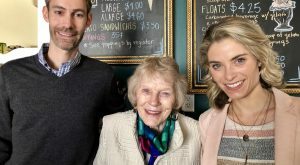 Mullen maintained that the only issue to be decided was the structural alterations that she said would have allowed more space for the units overall. Board members disagreed, contending that the criteria with which they’re charged to make such decisions takes into account whether the proposed use is “reasonable” and if it adversely impacts neighboring properties and values. 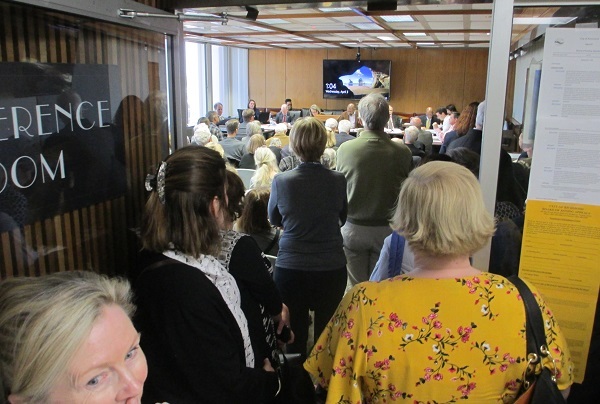 While Mullen noted the project can go forward without the permit, board member Roger York countered that it couldn’t as proposed for the purpose of the permit, as the smaller space to work with would likely require smaller – or fewer – units. “The applicant stated that if we turn this down, they can still develop this property. I don’t think there’s any question that they can do that. Whether they can get 63 units that are actually marketable is some question,” York said. The developer, an entity called Lee Medical Building Developer LLC, plans to go forward with the project despite the permit denial, said Matthew Raggi with Thalhimer Realty Partners, which is assisting with the project. 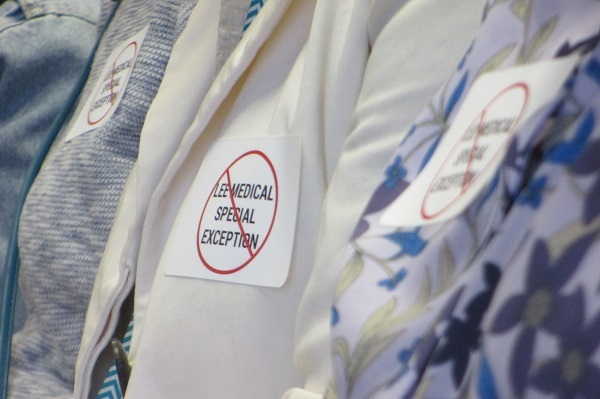 Opponents of the proposal came out in force at the hearing, many wearing stickers opposing the special exception. Among those who addressed the board were area resident Joe Reid, a partner at law firm McGuireWoods, and real estate agent Tom Innes, who submitted an affidavit as an industry expert testifying that the project would adversely affect neighboring property values. City Councilwoman Kim Gray, whose district includes the property, was among those who spoke in opposition at Wednesday’s hearing, reinforcing opponents’ concerns that the project as proposed was too dense and would add to parking and traffic concerns. A sticker worn by many of Wednesday’s attendees opposing the special exception. “I stand united with my constituents and ask that you deny this special exception,” Gray said. Plans call for converting the six-story building, which totals about 49,000 square feet, into 56 one-bedroom units and seven two-bedroom ones. Exact square footages could not be verified, though Mullen said they would average above 500. The building was put under contract to be purchased last summer. 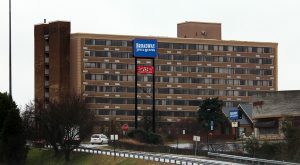 Raggi said at the time that the transaction was expected to close in a few months, but city property records still list the owner as Aramin Properties LLC, which purchased the building in 2005 for $2.4 million. A recent city assessment valued the 0.4-acre property at $2.34 million – up from a $2.2 million assessment last year. 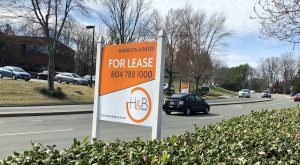 Raggi has said the apartments would be comparable in rental rates to newer Class A rental communities in the Fan and Museum districts such as Cary Street Station and Carytown Crossing. He said the conversion would maintain the building’s rear surface parking lot, which totals 63 spaces. The development team is working with local architects Scott Gordon of The Yellow Room Inc. and Robert Mills of RM Architect. Capstone Contracting is the proposed contractor for the project, and Timmons Group has handled site surveying. Virginia Credit Union is the proposed lender for the project, a cost estimate for which has not been released. Sadler & Whitehead is handling historic tax credit consulting. 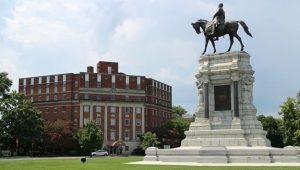 The project adds to other development and investment around Monument Avenue’s statue-centered traffic circles. One Monument Avenue on nearby Stuart Circle is being converted to condos after it was purchased last year in a $12 million deal. Nearby, a new six-story, 105-unit apartment building by Fountainhead Properties and WVS Cos. is under construction behind St. John’s United Church of Christ. Note: This story has been revised from its original version. 13 Comments on "Lee Medical Building conversion gets thumbs down from BZA"
There are plenty of apartment buildings all up and down Monument. Also, it is not a new building it is a commercial building turning into a residential building, which is exactly what was described. They just don’t want it to happen near them. If that isn’t NIMBY I don’t know what is. You are correct that they aren’t anti-development per se or even against businesses being converted to residential. Just anti-development and conversion near them, which is pretty much the definition of NIMBY…. Your story, if it is the whole story, (and I have no reason to doubt you) is even more of a reason that folks have no confidence in City officials or the councilman that are elected to serve each district. The amount of downright abuse of tax payer funds, lack of oversight or accountability is I am sure criminal at the least and certainly grounds for widespread firing of many staff. However, the city mentality is to keep everything internal, and just need to fire that pesky auditor.